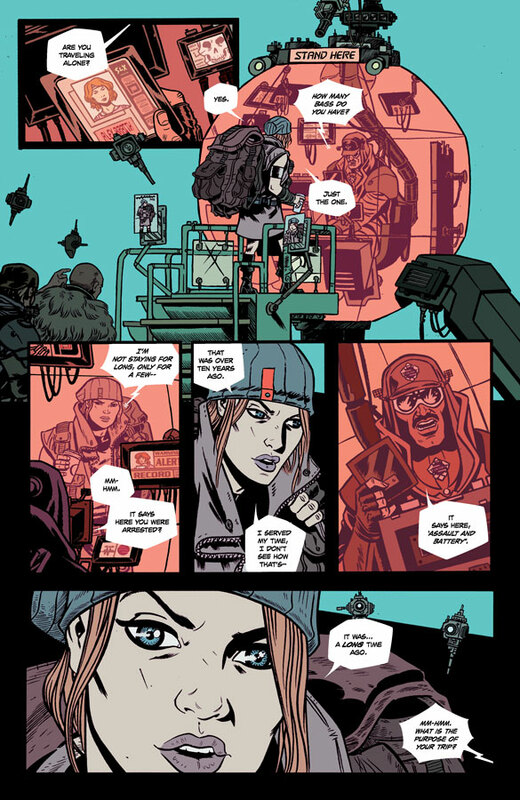 "I'm on a (space) boat"
When I interviewed Becky Cloonan along with Shaun Simon at New York Comic Con last October, she mentioned that she was getting more involved in writing. Cloonan, who initially was known for her art on titles like Demo and American Virgin, has shown a knack for writing as well. She wrote and illustrated the excellent Wolves and The Mire (the latter of which won an Eisner Award). Gotham Academy, a book she writes with Brendan Fletcher, has gotten many good reviews. During our interview, she also mentioned a new series she was writing for Image Comics called Southern Cross, and now that first issue of the series has arrived. 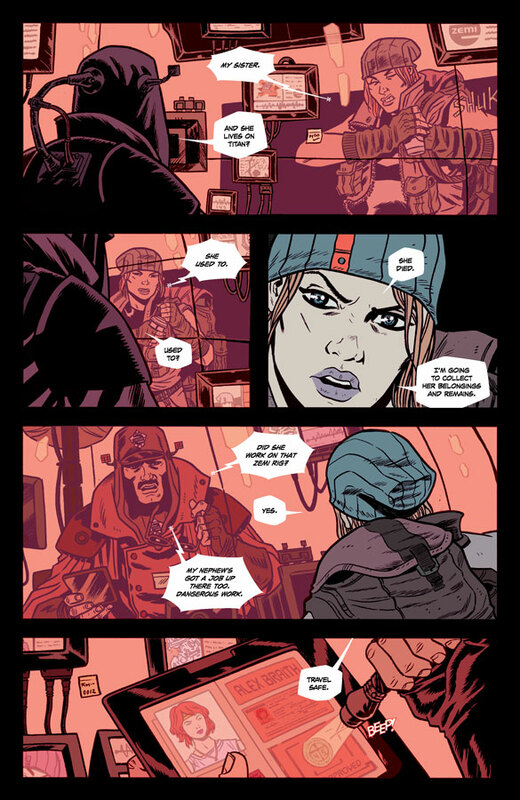 Although the title Southern Cross might sound like it is set in the America Civil Rights period (not unlike the other Image comic with “Southern” in the title – Southern Bastards). However, that impression would be totally inaccurate. Southern Cross #1 sets up the world rather efficiently. This is a futuristic tale, with elements of sci-fi and dystopia, but there is also a quest element involved (and possibly a revenge story). The story introduces us to Alex Braith, a young woman travelling on a space vessel to the moon Titan, which has been transformed into a dirty and dangerous mining location. Alex’s sister Amber died mysteriously while working on Titan and Alex is going to collect her belongings – and also figure out what happened. Although there are a great number of futuristic and dystopias on the comics market (probably too many) and many of them are well done, Southern Cross #1 still feels fresh. It’s the way that Cloonan and artist Andy Belanger ground the futurism in mundane details that works. For instance, Alex must go through a customs-like checkpoint and wait around something like an airport. Also, in spite of its future time, there isn’t a distracting amount of “science” gadgets. The other cool thing is that Alex is boarding a space boat (this is where the series title comes from), so we know it’s going to take time to get to Titan. As a protagonist, Alex is pretty interesting. She feels some “survivor’s guilt” because Amber was always the responsible one and she is the one who’s wound up dead. Alex is also rather anti-social. A number of crewmember try to chat with her, including a roommate, and Alex is totally not interested. The roommate seems to have some connection to Amber, which while perhaps a little too convenient, will likely ratchet up the drama in issue #2. 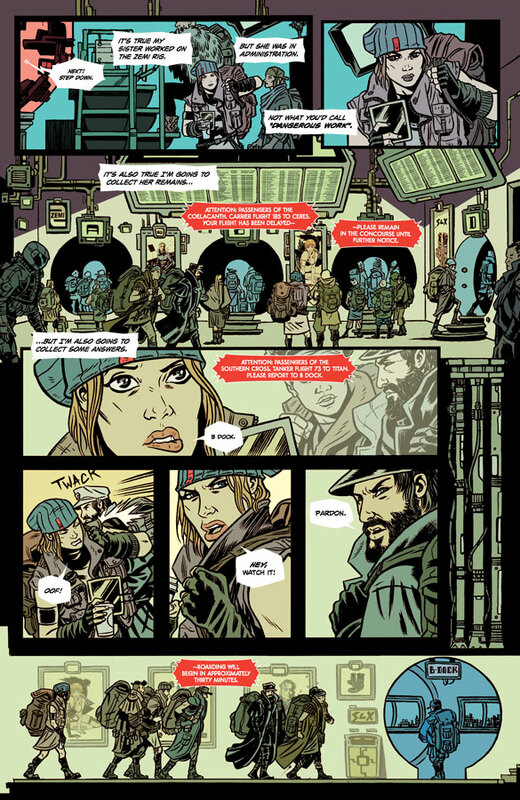 The pace of Southern Cross #1 is somewhat slow, though not in a bad way. Cloonan and Belanger introduce all of the essential story elements and give us a look at Alex’s personality. It would be too much to expect there to be wall-to-wall action as well. Now that the world has been established, though, I would expect the action and plot developments to occur more swiftly in future issues of the series. Belanger’s art is a little quirky, but overall it works for the world of Southern Cross. At times, character facial expressions seem unusual and unconvincing, though not to the degree that it makes the story hard to follow. Where Belanger excels, however, is in the backgrounds and futuristic touches of the world. There are some shots of the ship leaving the space harbor and there are fantastic. Similarly, I like the way that Belanger makes the ship look grimy and old. It’s not exactly steampunk, but there is a sort of “aged futurism” visual style in Southern Cross #1 that is effective and unique. It’s too early to tell what Southern Cross will turn into as a series, but there are many good things going on so far. It establishes a compelling and relatively original premise while also setting up sympathetic main character and a main plot mystery. That’s a lot to accomplish in a first issue. The art style of Belanger may not be too every reader’s liking, but he has some stand-out moments. Overall, Southern Cross #1 is a promising start.